X-CTU provides feature to test the range capabilities of RF modules. As range of these modules depends on several parameters, its a nice way to figure out the actual range and signal strength of modules at on-site location. 1. Download and install X-CTU 5.2.8.6 utility from Digi's site by clicking here. This article applies to legacy version of X-CTU and not to the latest X-CTU second generation (from version 6.0.0 onward). X-CTU II generation uses similar method by changing Cluster ID parameter to 12 for inbuilt "Range Test" feature. 2. Using X-CTU, load firmware 'Zigbee Coordinator AT' for coordinator and 'Zigbee Router AT' for other module(s). Cluster ID parameter is only applicable in AT firmware. 3. Set common PAN ID on all modules to form a network. 4. Lets say our goal is to test range of a router "R" from coordinator "C". 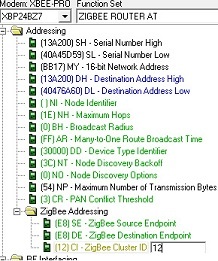 Therefore, we will first set destination address parameter of router with address of coordinator i.e. 'DH' (router) = 'SH' (coordinator) and 'DL' (router) = 'SL' (coordinator). 5. Now, set Cluster ID of router to value CI = 0x12. Its loopback cluster ID parameter. Any data sent to this cluster ID on the data endpoint will be transmitted back to the sender. Location of CI parameter in X-CTU can be seen in below image. 6. Now go to 'Range Test' tab of X-CTU. If you are interested in observing RSSI (signal strength) as well then check 'RSSI' checkbox. Click 'Start' button to initialize range testing. 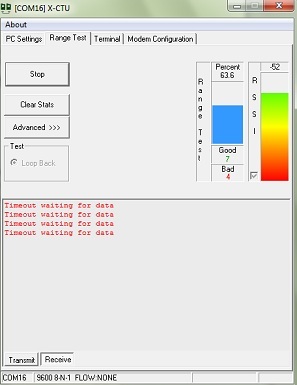 If remoter module "C" is within range of our test router "R" then we will observe screen similar to one provide below. Note that this value only indicates received signal strength of last hop of data packet. Move your router "R" in opposite direction to coordinator and keep on observing test results. In this way, you can figure out the actual operational range of your module at project site. Note: This article applies to DigiMesh radio networks as well. If "CI" parameter is not available on "Modem Configuration" tab of X-CTU, then edit it using AT command "ATCI" after you have enter in "Command Mode" on module.